In the 90's he created 'Formula Charity', which is based in Switzerland and aids a number of children's charities across Europe. 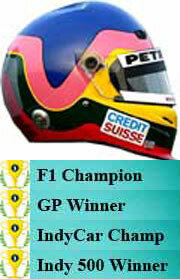 In 2009 he started the Jacques Villeneuve Academy, a driving academy in a partnership with the ICAR complex in Montreal. At the Winter Olympics 2010 in Vancouver, Canada he was one of eight famous Canadians who carried the Olympic Flag into the arena at the opening ceremony. Early 2010 Jacques was set to join Stafan GP, a new team without a entry slot but hoping to get one the new F1 slots, but it didn't happend. Later in 2010 Jaques submitted an application for the 13th place on the grid, under the name Villeneuve Racing partnered with Italian outfit Durango for 2011. FIA stated there would be no additional teams on the grid in 2011. 1999 - 0 #22 BAR PR01 0 0 0 0 0 16 12 11 dnf in a row! !